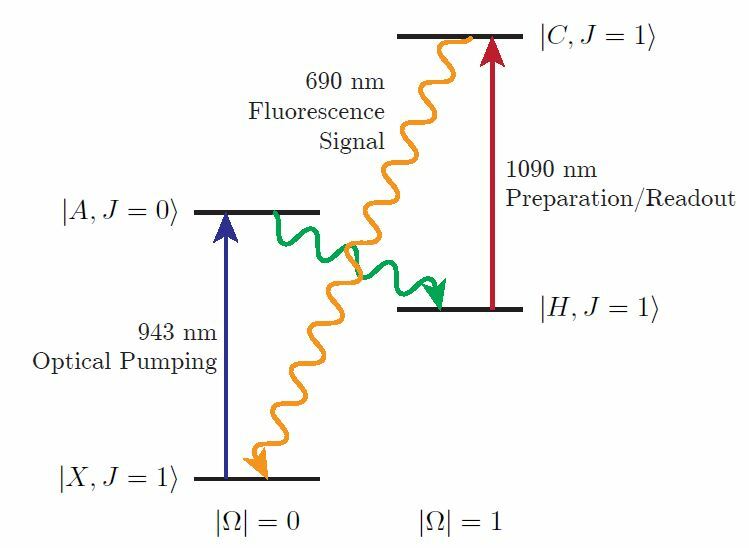 In the first two general articles I wrote about the ACME EDM experiment, I outlined the basic goal of the experiment (to measure the electron electric dipole moment) and the broad principle of how we accomplish that (by performing a spin precession measurement on a molecule in an electric field). Here, I will get into more detail about the crucial role in which the atomic structure of thorium monoxide plays into the spin precession measurement. I hope that this explanation will be somewhat comprehensible even to those who are not overly familiar with quantum mechanics. It’s probably true that nobody truly understands quantum mechanics, especially interpretations of quantum mechanics. Physicists can mathematically describe quantum systems pretty accurately, but understanding this requires knowledge of linear algebra and calculus. Thankfully, I discovered pretty early on in my research “career”1 that you don’t really need to understand what a quantum state really is to get a crude understanding of what happens when you shine a laser of a suitable wavelength on an atom. Nobody really explained this to me explicitly as a beginning researcher without knowledge of quantum mechanics, but I’d like to use this opportunity to codify how I would like have had it explained it to me then. Of course, for readers who are familiar with atomic energy levels, feel free to skip this section. The first thing to know is that atoms have energy states. These energy states are different from its kinetic energy or gravitational potential energy. If you think of an atom as a ball, then the faster it travels, the more kinetic energy it has. If its situated a certain distance from the ground, then it has some gravitational potential energy relative to the ground. The energy states I am talking about is more akin to how fast the ball spins when it travels around. The faster it spins, the more energy it has. In a slightly less crude picture, going back to the iconic Solar-system-like image of an atom consisting of a nucleus with electrons in orbit, an atom’s energy state is determined by the speed and size of the orbits of the electrons, or what we call states of angular momentum. A simple illustration of a possible energy level structure diagram for an atom. In the above diagram I have also highlighted the energy difference between the levels and This is important, because the discrete nature of the atom’s energy structure means that if it starts out at level , to get it to you need to give it the exact amount of energy difference between the two levels. In the scenario before, where the has 1 unit of energy and has 5 units, this means you have to impart it exactly 4 units of energy. If you give it 2, 3, or 5 units, then nothing will happen. If you give it 7 units then it will jump from to , which has 8 units of energy. And so on. How does one impart this energy? Short answer: using light. You may have heard that light has properties of both a particle and a wave. Here, the relevant property is that of a particle. A particle of light is called a photon. The color, or wavelength, of the light, determines the amount of energy stored in a single photon. So, if you want to go from to , then you need photons with exactly 4 units of energy. This is most easily achieved by using a laser, which is most easily understood in this context as a light source which is very finely tuned to emit only photons of the same amount of energy. If you’re lucky, you can get a laser which emits only photons of exactly 4 units of energy. In contrast to a laser, a more typical source of light like a lightbulb emits photons of many different colors, which means only a few photons would have the amount of energy you need, making the process more inefficient. The lowest possible energy level in an atom is called the ground state of an atom. It is a fact that even if you excite an atom to a higher energy state, after a period of time it will decay back into the ground state. In other words, the ground state is the more “natural” state. When this happens the atom will emit instead of absorb a photon, a process aptly named spontaneous emission. The color or wavelength of the photon will depend on the energy difference between the excited and ground state. The average time taken for spontaneous emission to happen differs according to which excited state it is in. This is called the lifetime of the state. This is an important fact to know, not just because of this experiment, but in general – all the light you see around you is ultimately a result of some atom or molecule getting de-excited from a higher to a lower energy state and emitting a photon as a result. That’s all there is to energy levels on an atom. The rest are details, some more important than others. An important one is that one can have multiple quantum numbers instead of just , for example and . This just means that the energy level diagram will look more complicated. To describe an energy level, you would have to specify what and numbers it has, for example , , or , . There are various rules which determine what combinations of and are possible (and which are applicable to all atoms) but they are not important to know at this point. There is also one last thing to know: energy levels can shift if you immerse the atom in an electric or magnetic field. For example, instead of an energy structure consisting of 1, 5, 8 units of energy, when an appropriate electric field is applied the energy levels can shift to 1, 5.2, and 8.1 units of energy. The structure is still discrete – you are only allowed to occupy one of the three levels, and nothing in between – but the shift can be continuous, depending on the strength of the electric or magnetic field. Such a shift is called a Stark shift (when an electric field is applied) or a Zeeman shift (when a magnetic field is applied). More interestingly, a Stark or Zeeman shift can cause energy levels to split, meaning that an atom can have more possible energy levels (or more steps in the staircase) when subjected to an electric or magnetic field. For example, it may be the case that the level with 5 units of energy (which we have chosen to call ) splits into two levels of 4.9 units and 5.1 units when subjected to the appropriate field. In such a case we would assign new quantum levels to the two sub-energy levels, say calling the state with 4.9 units the state and the state with 5.1 units the state. In the absence of the electric field, these two states would have the same energy level, and are thus indistinguishable from one another – we would call them degenerate states. The size of a Stark or Zeeman shift depends on the strength of the field. The above explanations also apply to molecules, which are “just” entities consisting of more than one atom bound together through some chemical bond. Because of their polyatomic nature, molecules can have more complicated ways to store energy: for example, in the case of a molecule with two atoms (or a diatomic molecule), the two atoms can vibrate closer and further from each other (thus giving vibrational degrees of freedom), or the whole molecule can rotate along several different axes (giving rotational degrees of freedom), and so on. Thus the energy level diagrams for molecules are even more complicated, with more quantum numbers needed to fully describe each energy level. For some reason chemists and molecular physicists have also adopted stranger conventions for describing the quantum numbers (instead of using the more commonly known , , and ). The ground state, for example, is called the -state. Higher energy states are denoted with other letters of the alphabet as quantum “numbers” – , , and so on. This is not even mentioning the other quantum numbers involved, which have also peculiar names. Energy level structure of ThO that we are concerned with in the ACME experiment. The color of the arrows between them indicate what color of laser light (approximately speaking) that is needed to transition from one state to another. Energy level diagram of the H-state of ThO, with all relevant quantum numbers. We can see that there are two additional quantum numbers, and We can also see additional dotted red and blue lines. The red lines indicates how far the energy level(s) will shift when applying a magnetic field (a Zeeman shift). The blue lines indicates the further energy level shift caused by a non-zero electron EDM. What one can conclude is that in the absence of magnetic field or an electron EDM (indicated by the black lines) then the and energy levels will become degenerate (i.e. having the same energy), and so is the case for the and energy levels. The magnetic field and electron EDM breaks the degeneracy between levels. In the case of the magnetic field the size of the Zeeman shift is expressed by the formula , meaning that it is proportional to the magnitude of the magnetic field. Note also that if we also turn off the external electric field, we will turn off the Stark shift as well, expressed by the formula . Then the levels also become degenerate. Armed with this basic knowledge about atomic and molecular states and of ThO’s energy level structure in particular, we are ready to start to delve into why the structure is unique and advantageous for the ACME experiment. Going back to the diagram of the -state, let us concentrate on the states, which are the states used in the experiment. It is also important to observe that in the presence of the electric field , the states react differently: one shifts up, the other shifts downwards. This is an important when we combine it with the fact that the states turn out to be states of opposite parity. What this means is that when the molecule is in the state, the effective electric field of the molecule, , points along the laboratory electric field, while when it is in the state, points opposite the laboratory electric field. The presence of such opposite parity states with different (non-degenerate) energy levels makes the -state of ThO described as having an omega doublet structure. where is the energy in the molecule coming from things other than the electron EDM. After performing the two measurements above, we can then subtract them: , and then easily extract out , the quantity we want. To reverse , one would normally reverse the actual electric field in the laboratory, say by reversing the voltage sent to the power supplies. But in practice, most power supplies are imbalanced in some way: if you set the voltage to 100 V, it may actually output 100.0 V, but if you set it to -100 V, then it might actually output -99.9 V, instead of -100.0 V. This produces a fatal mistake in the measurement – a systematic error. But with the presence of two states with opposite parity, this means that we can get the same effect as physically reversing the lab electric field by merely sending the molecule to a different state. This is only a matter of adjusting the wavelength of our lasers by a small amount, a much more controllable process than physically reversing the laboratory electric field. Such is the wonder of the omega doublet structure. Atoms have energy states of angular momentum. These energy states are discrete – atoms can only have certain integer values of energy. They are described by quantum numbers. An atom can be excited from a lower to a higher energy state using a laser emitting photons of the appropriate energy/wavelength. If an atom is in an excited state, after its lifetime passes it will tend to decay down to its lowest energy state – the ground state. The energy level structure of an atom can be altered by subjecting the atom to an electric or magnetic field. The energy of individual states can shift up or down, or they can even split. All the above applies equally to molecules (which are just collections of multiple atoms bonded together). The caveat is that molecules have more complicated quantum numbers and more complicated energy level structures in general. From there, we delved into the atomic structure of thorium monoxide, zooming into the state, in which we perform the spin precession measurement described in the previous post. A major advantage of this state is that it has an omega doublet structure, in which states of different parity are close together, such that we can simulate reversing the laboratory effective field by simply changing the parity state we perform the spin precession measurement in. Omega doublet structure in the experimental -state. Large effective electric field – the electron on the molecule experiences an electric field a billion times larger than the one we apply to it. Next Next post: What Does Day-To-Day Work Have To Do With God?